To the Board of Directors of the Association of Tourist Establishments "ATLANTIDA" invites you to honor with your presence the Feast of St. Polycarp to be celebrated at the Church of Our Lady Giatrissa Condohori at 17:00. After the ceremony local panigyris will be served. He was born about 60 years after Christ. In the 20th year of his age became a Christian. 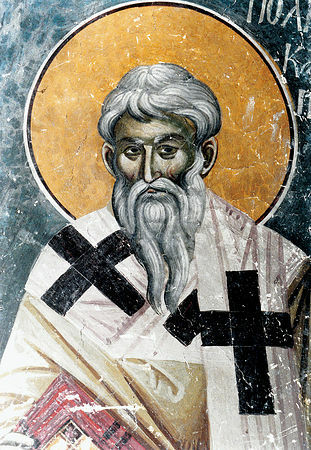 As he writes his student Irenaeus, Polycarp was ornate with great wisdom, moral rigor and wholehearted dedication to teaching the divine word. The assets of these and generosity made ​​him very popular in the evangelist John, who later made ​​him bishop of Smyrna. In this office, performed a office by purely apostolic zeal. He became a teacher, a father, a pastor, a watchman. When they began the persecution of Christians under Emperor Anthony Pius, the proconsul of Asia Statius Kordatos after furious requirement of the pagan mob, arrested Polycarp and ordered him to blaspheme Christ publicly. The Bishop of elder replied: "For 86 years his servant, without even a wronged. And how can I now blaspheme my King and Savior ?" Immediately then threw him into the fire to burn alive. But the fire leaves him untouched! Then , an executioner knocks him with his sword and kills him. Thus on 23 February 167 , the great sportsman of faith shall terminate his life. In him, of course, fully implemented the word of God in Revelation: " Fear Zero , a FUTURE pathein ... Be faithful Achrian death and give thee a crown of life." That is, do not be afraid for what is going to happen to you . Tended to be faithful unto death and I will give you the crown of eternal life.